Peptide GHSHDVTERELRN(C), corresponding to amino acid residues 41-53 of rat NR2A (Accession Q00959). Extracellular, N-terminus. Standard quality control of each lot Western blot analysis (unlabeled antibody,#AGC-002), and immunohistochemistry (labeled antibody). Immunohistochemical staining of perfusion-fixed frozen mouse brain sections using Anti-NMDAR2A (GluN2A) (extracellular)-ATTO-488 Antibody (#AGC-002-AG), (1:80). A. NR2A staining (green) in striatum is detected in neuronal profiles. B. NR2A staining in cingulate cortex is also detected in neuronal profiles. Cell nuclei are labeled with DAPI (blue). NMDAR is unique among ligand-gated ion channels in that it requires the simultaneous binding of two obligatory agonists: glycine and glutamate that bind to the NMDAR1 and NMDAR2 binding sites respectively. Another unique characteristic of the NMDA receptors is their dependence on membrane potential. At resting membrane potentials the channels are blocked by extracellular Mg2+. Neuronal depolarization relieves the Mg2+ blockage and allows ion influx into the cells. NMDA receptors are strongly selective for Ca2+ influx differing from the other glutamate receptor ion channels that are non-selective cation channels. Immuno-colocalization of GluN2A and SynGAP in rat cingulate cortex.Immunohistochemical staining of immersion-fixed, free floating rat brain frozen sections using Anti-NMDAR2A (GluN2A) (extracellular)-ATTO-488 Antibody (#AGC-002-AG), (1:200) and Anti-SynGAP Antibody (#APZ-032), (1:200), followed by donkey-anti-rabbit-Cy3. A. GluN2A staining (green) appears in neuronal profiles (arrows). B. SynGAP staining (red) is detected mostly in apical dendrites (horizontal arrows) and in neuronal soma (vertical arrows). 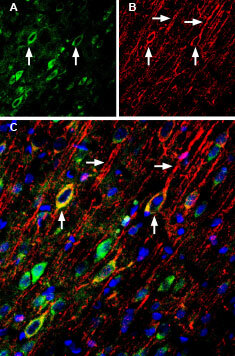 C. Merge of the two images demonstrates colocalization in some neurons (vertical arrows). Cell nuclei are stained with DAPI (blue). Anti-NMDAR2A (GluN2A) (extracellular) Antibody (#AGC-002) is a highly specific antibody directed against an extracellular epitope of the rat protein. The antibody can be used in western blot, immunoprecipitation, immunocytochemistry, and immunohistochemistry. It has been designed to recognize GluN2A from rat, mouse, and human samples. Anti-NMDAR2A (GluN2A) (extracellular)-ATTO-488 Antibody (#AGC-002-AG) is directly labeled with an ATTO-488 fluorescent dye. ATTO dyes are characterized by strong absorption (high extinction coefficient), high fluorescence quantum yield, and high photo-stability. The ATTO-488 label is analogous to the well known dye fluorescein isothiocyanate (FITC) and can be used with filters typically used to detect FITC. Anti-NMDAR2A (GluN2A) (extracellular)-ATTO-488 Antibody has been tested in immunohistochemistry and is especially suited for experiments requiring simultaneous labeling of different markers. Anti-NMDAR2A (GluN2A) (extracellular) Antibody (#AGC-002), (for western blot analysis).